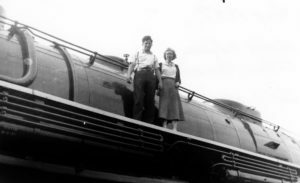 Above, after graduating from West Valley High School earlier in 1929, Verne’s dad was able to get on at the Northern Pacific roundhouse as a laborer. In 1936, he qualified as a fireman. This is a unique engine, commissioned by the Timken Roller Bearing Company to demonstrate the superiority of roller bearings over the older friction bearings. 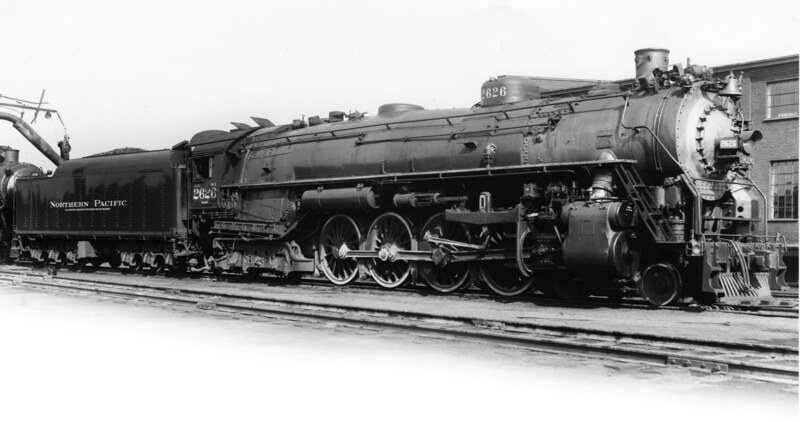 After the engine, then numbered 1111 and known as the Four Aces, had demonstrated on railroads all over the Country, the Northern Pacific bought it. Photo courtesy of the Alexander Family Archives. Read part one of our three part series on 2124 North Fancher here. Read part two of our three part series on 2124 North Fancher here. My dad graduated from West Valley High School in 1929, and in the month of September of that year went to work for the Northern Pacific Railroad as a roundhouse laborer, or “grease monkey” as he used to refer to the job. This marked the beginning of a transition at 2124 North Fancher. The most immediate effect was that Bertie no longer had to work to earn subsistence money. Dad took over that responsibility. Bertie liked to travel, and by virtue of dad’s railroad employment, she was given a pass that enabled her to travel anywhere in the country on any railroad for free. She took advantage of that. It was no longer necessary for her to be at 2124 all the time. Five of her daughters were married and out of the house, and Dora, though single, had been out of the house even while still in high school. She married the next year, as did Bonnie. Muriel did not marry until 1936, but it seems that she had left 2124 many years earlier. It appears that after Bonnie married on August 30, 1930, the once bustling 2124 was shelter only to Bertie, my dad and boarder Clare Hartnett. An era had drawn to a close, and another was about to open. My 18-year-old father met a girl. Her name was Irene Ponto. She was a sophomore at Lewis and Clark High School, and very quickly they fell in love, and made plans to marry once she had completed school. Irene’s mother, Grace, was adamantly opposed to this impending marriage, and on at least one occasion their arguments about it resulted in violence. Bertie, on the other hand, was quite supportive of the young couple. She liked Irene, and she knew that she was getting too old to support herself and keep up the needs of 2124. So Bertie made a deal with her son, Robert. She would deed 2124 over to him, in exchange for the right to live there for the rest of her days, with his support. As far as I have been able to discover, none of Bertie’s eight daughters, seven of whom were married with homes of their own and Muriel doing quite well on her own, objected to this arrangement. They were all quite fond of their little brother, and appreciative of all that he had done for the family and for their mother. It seems fair to say that in their eyes my dad was getting his just due, and their mother was getting solid security for her old age. I’ve discovered no evidence that any of them felt resentment over this de facto disinheritance. 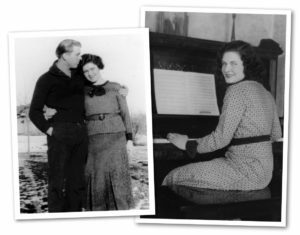 Bob and Irene were married in Kellogg, Idaho on May 29, 1932 by a former minister at Irene’s church in Spokane, Centenary Methodist. Bertie deeded the house over to Dad May 8,1946. Moving into 2124 must have been a huge and daunting adjustment for my mother! She had just turned 18, and just graduated from high school, and all of a sudden, doing those things that married people do—and she is doing them in her mother-in-law’s house! Yes, technically the house would eventually belong to her husband and herself, but in all other ways the house was Bertie’s. In the summer of 1952, Bob Alexander undertook a major construction project. He took down the tank house and the old 1927 single car garage and shop. In their place, he built a two-car garage, with a much larger separate shop area at this south end of the structure. Photo courtesy of the Alexander Family Archives. For 29 years, Bertie had things set up her way and had developed habits of how things were to be done. The interaction between Bertie and my mom could have been cataclysmic, but by all accounts it was not. More than one person has noted how well the two women meshed. Perhaps my mom felt relief over finally getting to experience a friendly mom-figure. Her mother, Grace Ponto (later Thompson), was always very nice to me, and to others who were not her children. But she was very strict with my mom, and mom’s brother and sister, Uncle George and Aunt Marian. Still, I doubt very much that my mother had the opportunity to put her own stamp on the place, although I don’t really know if that is true. In any case, the new living arrangement at 2124, although unprecedented, was working very well. Boarder Clare Hartnett moved out, so it was just my mom and dad and grandma Bertie living there. The place must have seemed very empty to Bertie and my dad, who had all those years of experiencing 2124 being full to the rafters! I joined them in 1937, and 2124 entered a new phase of existence. Once featuring large numbers of inhabitants, a haven for nine children and countless boarders, it now became host to three generations of occupants. For the first few years of my dad’s employment by the Northern Pacific, available work reflected the economic conditions of the Great Depression. He would work for a time, and then be “cut off” when business slowed. Sometimes during these slow periods he was able to obtain work shoveling coal at the Central Heating Plant in downtown Spokane. (Uncle Paul Staeheli had a neighbor who knew someone in authority there.) Although there was not a lot of money sometimes, at least there was some money. The property at 2124 no longer needed to generate income. I don’t know when the cow and chickens disappeared, but disappear they did. Gardens continued to be put in, but just for our family’s use. And not all of the garden had to be vegetables. More flowers could be planted. The resources of the 2124 property turned toward the nurturing of children. Pictured at right, Irene Ponto at the piano, a senior at Lewis and Clark High School at the time. 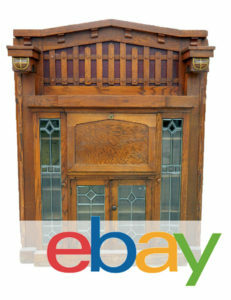 The piano was taken in by Elmer in the first decade of the twentieth century as payment for some kind of mining service. Two of his daughters bartered personal services for piano lessons, but neither was able to stick with it. Irene is posing—she couldn’t play it either. At left, Verne’s mother and father, Irene and Bob, married on May 29, 1932, right after his mom graduated from Lewis and Clark High School. They lived at 2124 from that time forward. In this 1935 photo, dated on New Year’s Day, they’re ready for their first hike of the season. Photos courtesy of the Alexander Family Archives. Life got pretty rigorous at times in the earlier days. Washday was an absolute nightmare in hot weather. The only way to get hot water until after World War II was to fire up the Monarch wood range in the kitchen. It was fitted with water pipes near where the fire was. Cold water was fed into these pipes, heated therein and stored in a vertical cast iron tank behind the stove. On washday the fire in the stove was started. The procedure was to put wadded up newspaper in, followed by kindling wood, followed by larger pieces of wood, followed by ignition with a wooden match, followed by the addition of still larger pieces of wood and culminating with the addition of coal. The stove got hot, the water got hot and the room got hotter than it already was from the ambient temperature of, say, a day in July. I would just parenthetically note here that the wood we burned was free. Working on the railroad gave dad first eyes on available wood that had been used as dunnage to secure loads in freight cars. He salvaged it regularly, saving the better quality for use in building things and burning the rest for heat. In my time a major source of firewood was planking he salvaged from the demolition of a loading dock. In my younger siblings’ time, it was wood salvaged when the Northern Pacific coal dock was taken down. Other sources of firewood were defective match blocks discarded by the Diamond Match company less than a mile south on Fancher, and mill ends from the sawmill just west of Parkwater. All of this was available for the taking in those days, and my dad, who was a huge fan of free, did take it! Returning to the washday theme, after enough water had been heated equipment was brought into the house from the screen porch. The washing machine was on casters and was powered by electricity. Then two carts on casters were brought in, on top of which were carried three large washtubs, about three feet in diameter. These had to be filled with hot water. That is a lot of hot water, and the stove was constantly being stoked to keep up with the demand. On occasion the stove would get so hot that the exposed smokepipe to the chimney would glow red hot, creating fear of a chimney fire that would burn the house down. The material to be washed was removed from the washing machine, and run through a ringer into the first rinse tub. It would then be stirred with a laundry stick about two feet long and an inch in diameter, made by my dad from hardwood. Then the wringer was swung 90 degrees and the wash was wrung into a second rinse tub. There was a third rinse tub in which the water contained something I think they called “bluing.” I am not sure of its purpose, or whether it was last or next to last in the rinsing sequence. Really dirty stuff, like my dad’s work overalls and my cat poo overalls, got a workout on an old fashioned washboard prior to going into the washing machine. The predominant impression that has stayed with me is that wash day was really hard work, for two or more people, in over 100 degree temperatures, for a very long time! The clothes then had to be dried. This took place on outdoor clotheslines, built by my dad. They had 4” by 4” posts at each end set in concrete in the ground. Cross arms at the top anchored four heavy wire lines on which clothes could be pinned, at a height convenient for my mother to pin them. There is nothing like the smell of clean laundry dried in this manner. But there was an added hazard at 2124. 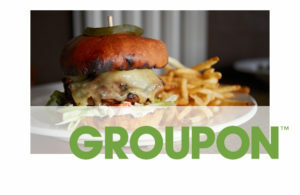 It was situated about three blocks from the Northern Pacific roundhouse. When they fired up a cold locomotive after working on it, a tremendous amount of very dirty smoke was generated. If the wind was just right, as it far too often was, the smoke headed straight for 2124. When that happened, all available hands were to sprint to the clothesline and get the clothes down before the smoke could get there and render them in need of washing again. Something a notch above excitement occurred in everyone involved in one of these rescue missions! The first location I remember for the clothesline was on the lawn south of the house. Later my dad moved it eastward, roughly between the edge of the rock pile and the wood shed, where it had a much longer run and hence a larger drying capacity. Parenthetically I would add that in addition to their official function, the clothesline posts made an excellent place to tie up captives when playing cowboys and indians! 2124 got a number of upgrades during and after World War II. 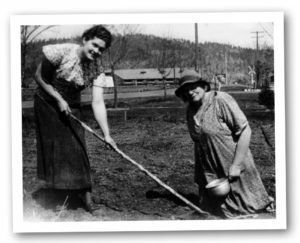 In about 1943, the City of Spokane extended a sewer line eastward on Mansfield to service the many Women’s Army Corps barracks that were built across the street from our property. We were allowed to make a hookup to this sewer line, so we no longer had to maintain the cesspool under the north lawn. I had thought our hookup was allowed right away, but my brother David is pretty sure it was not until 1951. Washday moved out of the kitchen. Dad plumbed a line into the screen porch to dispose of waste water from the washing machine, but the date of this is lost to me. In June of 1937, 2124 became shelter for the third generation of Alexanders. 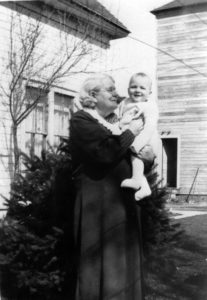 That is when Verne was born, and here he is on March 31, 1938 with grandma Bertie. Photo courtesy of the Alexander Family Archives. Prior to the war, food storage was a problem. Some things could be stored in what was called the “cooler,” which consisted of a cupboard under the kitchen counter that had cold water pipes running through it. There was an ice box in Bertie’s room just off the kitchen, but it had not been used since my parents bought a GE refrigerator in 1939. 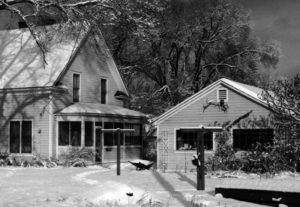 The refrigerator had very minimal freezing capacity, so we rented a cold storage locker at the original Rosauer store in Parkwater to store frozen fish, game and huckleberries. My brother Ken recalls how food from the cold storage locker sometimes took on the flavor of leaking refrigerant! The refrigerator itself was indestructible, being sold still in working condition in 2001 or 2002. Finally, the Monarch wood range was taken out of the kitchen and replaced by an electric range. The cast iron water tank was removed and replaced by an electric water heater and a new sink and drain board combination was installed. The wood heating stove in the living room may have gone away in this time period as well, replaced by an oil burning heater that, like the refrigerator, was indestructible and lasted until the end. The change from wood and coal heating to electric and oil had major lifestyle repercussions. There was still a trash burner to be fueled occasionally, but the volume of wood and coal that needed to be fetched to the house diminished greatly. That was an especially good thing if you were a kid. No so good was the loss of the Monarch range oven as a warmer of wet and cold young bodies who had been outside in wet and cold weather. My younger brothers and sister remember sitting on the open oven door and taking in the warmth. I had not been allowed to sit on the door, but I would place a chair in front of the oven and place my feet inside. I regarded this as one of my life’s greatest pleasures! There were also personnel changes during this era. My brother Ken joined us in June of 1943, and in August of 1945 my twin brother and sister David and Jean were born. Then grandma Bertie died in December of 1946. 2124 was back to sheltering just two generations—Robert, Irene, and four kids. The next big change came in 1952. We took down the tank house and the garage. In their place, Dad built a double garage with an enclosed shop about four times the size of his previous shop at the south end of the structure. There was a loft above the shop for storage, with a stairway down into the garage. A part of the rock pile was removed to make room for the new construction. I was a part of all of this. I vividly remember being 22 feet up in the air taking siding off the tank house, fearing the whole time that I would lose my balance and fall to my death. Heights and I do not play well together! With the tank house down, my labors turned to shoveling trailer after trailer full of rock pile dirt to be hauled away to make room for the shop. The up side of all this was that I got to do some driving in the 1937 Ford that had been the family car for several years until dad bought a used 1949 Ford. I was 15 years old and looking forward to getting my license. The 1937 Ford would then become “my” car, although I never officially owned it. Tank house down and a hole made in the rock pile, I helped nail siding to the new garage and shop structure. I don’t remember helping to roof it. In about 1963, four years after I had married and moved to California, Dad took down the old stable/coal bin/woodshed complex and replaced it with a new, garage-sized structure that he used for storage. This construction completed, the 2124 house and grounds had reached its final configuration. By the late 1960s, all of my siblings and I were out in the world on our own, and mom and dad had the place to themselves. It must have seemed very empty by contrast to the crowd scene it had been since 1911. My parents both had active interests, and were well known in Spokane’s stamp and coin collecting communities. Mom got interested in growing Iris. The ground once cultivated for growing vegetables for subsistence now became host to an incredible variety of Iris plants. Dad devised a process for acid etching the names of the various plants into an aluminum plate which was driven into the ground on an attached metal rod to identify the species. This Iris garden became a destination by word of mouth. It was very common for strangers to drive by slowly, and some stopped in to look and to talk flowers. Dad did things to help out his sisters who lived in the area, and mom put on slide shows at rest and convalescent homes. They did quite a bit of travelling. Their children brought them grandchildren to play with every so often, and old friends used to drop by with frequency. Anyone coming to 2124 in good weather was treated/subjected after dusk to one of my dad’s famous outdoor slide shows. These were a mixed blessing, and an unforgettable experience. Three brand new giant freight locomotives were delivered to the Northern Pacific at Parkwater in May 1937, just before Verne Alexander was born. Ben Hansen, one of Bertie’s original Northern Pacific boarders at 2124, married Bertie’s daughter Vesta. Pictured on the 5114 is their daughter Esther and her fiancé, Mark Edgar. Sadly, 22 years later, her father, Ben, would die while running this very engine in Montana. Photo courtesy of the Alexander Family Archives. Things changed radically in 1979, when my dad was diagnosed with cancer. He also had a stroke. He passed away in April of 1980. He was born in the house, and he died there after 69 years of a very full life. 2124, once so vibrant and full of people, was now home to just my mother. She soldiered on for another 19 years, doing her stamp collecting, visiting old folks places and taking periodic trips to visit daughter Jean Sack and her family back in Maryland and son Ken and his family in Illinois. However, she was losing her mobility, and first a walker and then a wheelchair became her constant companions. The house and grounds were huge, and there was no way she could properly take care of them. My brother David and his son Bob took care of the grounds and any fix-it jobs that came along, but the interior of the house suffered. The most charitable way I can say this is that my mother collected and saved things for future use when she had time to get around to it. The collection was extremely large, and most of it was flammable. This raised some concern among friends and family, and serious consideration was given to moving her to a retirement home of some sort. But 2124 was where she had lived since she was 18 years old, and she was determined that she would finish her days there. The train of thought that ultimately prevailed was that any type of cataclysmic event that took place while she was living there alone would be preferable, for her, to the pain and angst she would experience if forced to leave. The cataclysmic event that occurred was totally unforeseen, and came from the outside. On November 19, 1996, the Spokane area was hit by a series of rain and snow storms in the midst of severe cold. The rain and snow quickly froze into ice. Lots of ice. Heavy ice. It collected in trees and took them down. It collected on power lines and took them down. Thousands of homes were without electricity. 2124 was one of them. The area-wide damage was massive, far outstripping the resources available to fix it, even when additional resources were brought in from outside the stricken area. The number of days without electricity began to grow. The Washington Water Power Company urged her to go to a shelter until power was restored, but she did not want to and did not do so. She had heat from the oil burner, but no light, no hot water and no means of food preparation. But she had a stubborn toughness, and at age 82 she lived like this for eight days until power was restored! Some think she was foolish to put herself through all this, but I see it as an impressive action to maintain control over her life and circumstances. I admire it. She lived alone at 2124 for another two and a half years, with assistance from Meals on Wheels and a periodic daytime helper. The end came in May of 1999. She fell trying to get into the house, and was taken by ambulance to the hospital. The treatment she got at the hospital was unsuccessful, and may even have exacerbated the knee problems that were the source of her fall. When sent home she could not get up the stairs into the house. She was moved to a care facility to convalesce, the hope being that her knees would get better. She absolutely hated it there. She had attended Centenary Methodist Church all her life to that point, and just did not use bad language. However she was so miserable and angry at the convalescent home that she was swearing a blue streak! She wanted to go back to 2124. I had power of attorney and got her out and back home. She was grateful, but also unable to care for herself. Arrangements were made for a live-in helper, and the house was reconfigured to accommodate that helper. I think she saw then that things would never again be how she wanted them to be, and lost her will to live. A couple of days later she was brought to the breakfast table, where she quietly died. She had lived in that house for her entire adult life, sometimes under trying circumstances, and I like to think that for a brief moment she was able to take comfort in the fact that she was dying there. 2124 was now empty of Alexanders for the first time ever—a span of 96 years. This was temporary. My brother David bought the house as a place for his son Bob to live while completing college. 2124 had now become home to a fourth generation. But Bob graduated, and David sold the house to a local businessman in 2002. Moving in with one’s mother-in-law right after getting married is a difficult task, but observations from relatives indicate that Irene and Bertie got along very well with each other. This photo shows them planting peas in the vegetable garden south of the house. Note in the background the Siberian elm, black walnut and blue spruce trees that my dad planted between 1927 and 1930. As they grew over the years they became the signature representation of the property. Photo courtesy of the Alexander Family Archives. It seemed at the time that the house was to have been remodeled and converted into offices. The porches were removed, but otherwise the exterior retained its integrity. A new roof was put on, and the interior was completely gutted. Ground was moved and footings for a wheelchair access ramp were poured where the back porch used to be. Then all work stopped. The rumor was that the new owner was in the midst of divorce proceedings, and that nothing could be done until these proceedings were concluded. The house lay fallow, so to speak, and became kind of a dumping ground. However I found during my most recent visit in August of 2015 that some changes had been made. All the old tires that had been dumped there were gone, and the ramp footings had been removed and the ground restored. Somebody is making preparations for something, but just what is unknown. So the visible shell of 2124, and its trees, are still there, bereft of their life and vibrancy for those of us who once lived there. But full of rich history and memories, some of which I have attempted to convey in this article. I want to acknowledge the contribution of my brother David to the writing of this story. He did the lion’s share of the research over a period of many years, and freely shared it with the rest of us. Thanks, also, to my brother Ken and my sister Jean for their helpful responses to my request for input on their memories of life at 2124. This project spawned a lot of nostalgia among the four of us, and we had a lot of fun emailing one another with memories and comments for a few days.